The protein encoded by FNDC5 can be cleaved into Irisin, which is a myokine linked to exercise and lean body mass. It was reported that FNDC5 significantly decreased cell number, migration and viability through apoptosis in malignant MDA-MB-231 cells. Thus MDA-MB-231 cells were seeded overnight at a density of 5,000 cells/well, and treated with or without various concentrations of FNDC5 for 48h, then MDA-MB-231 cells were observed by inverted microscope and cell viability was measured by Cell Counting Kit-8 (CCK-8). Briefly, 10µL of CCK-8 solution was added to each well of the plate, then measure the absorbance at 450nm using a microplate reader after incubating the plate for 1-4 hours in at 37oC. 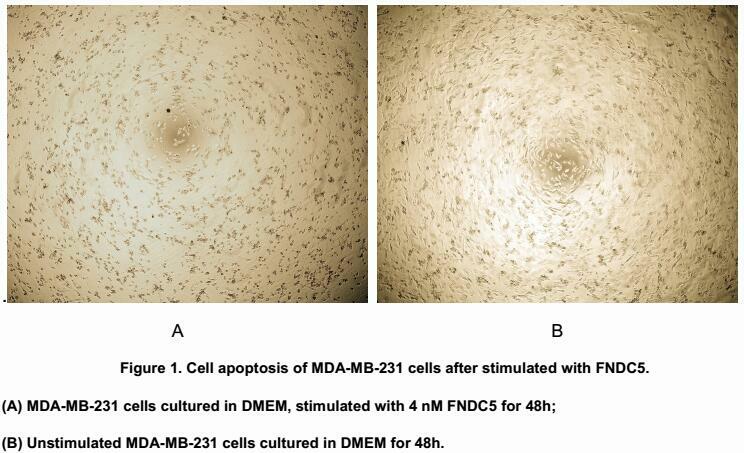 Cell apoptosis of MDA-MB-231 cells after incubation with FNDC5 for 48h observed by inverted microscope was shown in Figure 1. 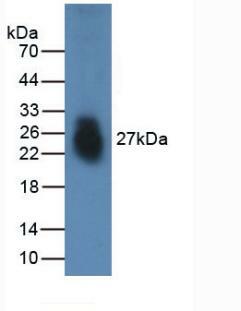 Cell viability was assessed by CCK-8 (Cell Counting Kit-8 ) assay after incubation with various concentrations of FNDC5 for 48h. 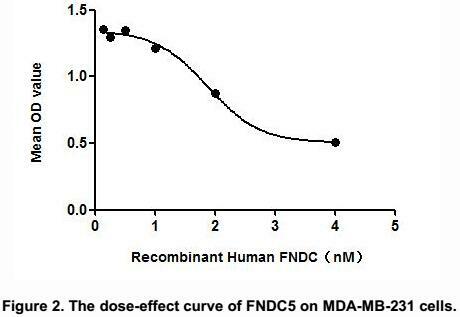 The dose-effect curve of FNDC5 was shown in Figure 2. It was obvious that FNDC5 significantly decreased cell viability of MDA-MB-231 cells. The ED50 for this effect is typically 1.875 nM. Reconstitute in PBS (pH7.6) to a concentration of 0.1-1.0 mg/mL. Do not vortex. STORAGEAvoid repeated freeze/thaw cycles. Store at 2-8°C for one month. Aliquot and store at -80°C for 12 months.